Bob Harris knows what it is like to feel invincible. 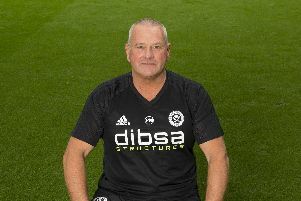 After all, the Sheffield United defender was a member of the squad which won 10 straight games, conceding only one goal in the process, two seasons ago. The catalyst for that run, which propelled United out of the relegation zone and to within touching distance of the play-offs in just three short months, was a painful defeat at Crewe Alexandra. So, as they enter this afternoon’s derby with Barnsley under intense scrutiny following Tueday’s 4-2 defeat by Shrewsbury Town, Harris explained how a positive result could dramatically change the mood music surrounding Nigel Adkins’ first team squad. United travel to Oakwell 12th in the League One table - five points behind sixth-placed Bradford City - and 10 places above Lee Johnson’s side. Although Adkins issued his own damning critique of their performance against Shrewsbury, describing it as “unacceptable”, the United manager cited inconsistent selections, a consequence of some long-standing injury issues, as a mitigating factor behind their chequered form of late. Echoing those sentiments, Harris said: “Those partnerships can take a while, and not just with defenders. But once you get into a routine, of knowing what everybody’s strengths and weaknesses are, they tend to develop pretty quickly.